Oshogatsu (New Year's) didn't begin or end in Osaka. It started just after Christmas with oosouji (great cleaning), which for most families involves the complete cleaning of the house from top to bottom in order to purify it for the coming new year. My oosouji consisted of doing a giant pile of dishes and giving the sink an extra-thorough scrubbing, so it wasn't that great of a cleaning, but I think I did pretty well under the circumstances. Our home thus purified, we took the Christmas wreath down from the front door and replaced it with the shimekazari above. This is a special decoration that designates a space as holy, welcoming the gods and warding off bad luck. 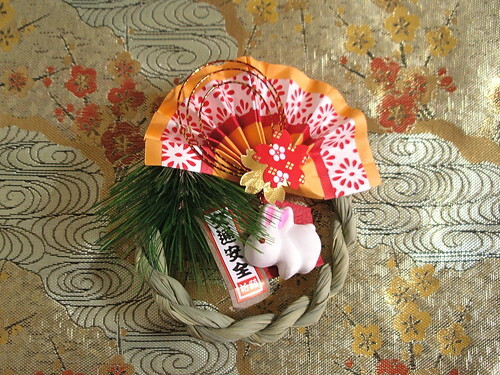 Each component symbolizes some sort of wish for the new year (the fake pine branch in ours represents longetivity, but don't ask me about the other stuff), and it is hung not only on front doors of homes, but at shops, restaurants, and on cars. This particular one was chosen because it was the smallest, least gaudy, and most importantly, the cheapest we could find and it wasn't until I took it down a couple weeks later that I noticed it said koutsuu anzen, which means "traffic safety". It was meant to be hung on a car. My husband, who is allegedly Japanese, helped pick it out and either didn't bother reading it or didn't think he needed to mention that this was for cars only. But the numerous people who saw it (our landlords who live next door, their son's family, who live upstairs, various mail carriers and delivery people) probably thought "Jesus, when is that idiot foreigner going to learn how to read?" Inside the house was another decoration: the kagami mochi (literally "mirror mochi"). These slabs of mochi (rice paste) are usually topped with a daidai citrus, symbolizing the wish for fertility. But as we've had quite enough of that already we went for the non-traditional but more appropriate maneki neko (beckoning cat), which represents our desire for cold hard cash. 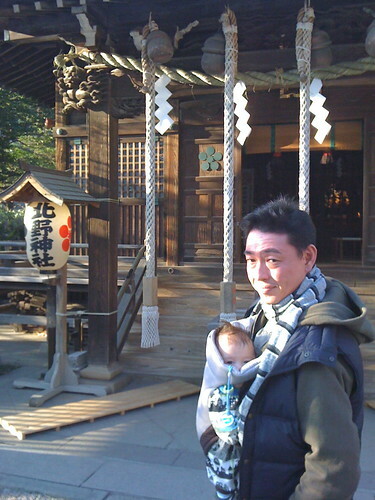 After we'd all returned from Osaka in the new year, we went to a local shrine for hatsumoude (first prayer of the year). 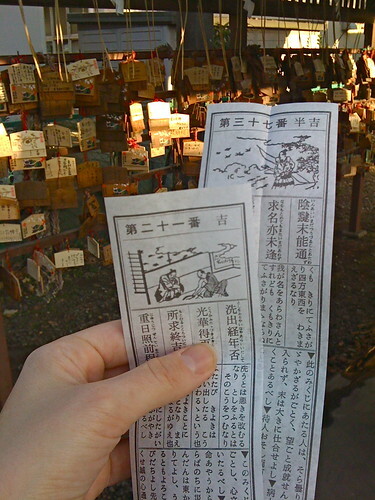 Once we'd offered our prayers we bought our fortunes in the form of these omikuji. Mine on the left says kichi (good luck) and Hideaki's says hankichi (half good luck), which is a designation we'd never heard of so we asked the lady behind the counter what exactly it meant. It turns out that she was a philosophical type, and her explanation started off with "Well, the fortunes can't really be ranked from good to bad" (except that they totally can) and went on for quite some time, with gist being "it doesn't really matter what your fortune says, it's how you yourself decide interpret it". We found it pretty funny considering omikuji always come with extremely specific designations ranging from daikichi (best good luck) to daikyou (worst bad luck) and very detailed predictions in a number of categories like "love", "study", and "health". We still have no idea what hankichi means: is it half luck as in neutral? or as in half-way between regular good luck and best good luck? what is the difference between hankichi and chuukichi (medium luck)? But we've been having lots of fun mimicking the shrine lady (for example, in answer to "Is this towel clean? ": "Well, it can't really be designated as clean or dirty. It's up to you to decide its level of cleanliness"). 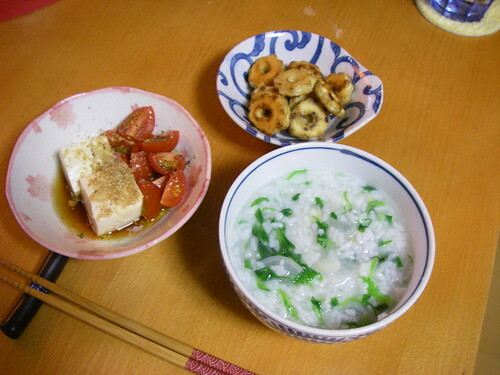 On January 7th we ate the customary nanakusagayu, which is rice porridge with the seven herbs of spring. Those herbs were described a few years back, and a few years before that I posted a recipe. The next thing to be done in the new year was kagami biraki (breaking the mirror). 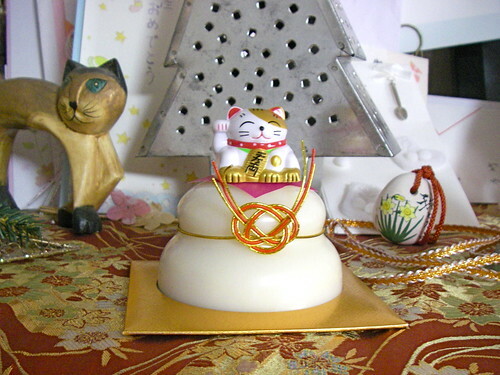 This is when the kagami mochi that was displayed at the end of the year is broken and eaten. 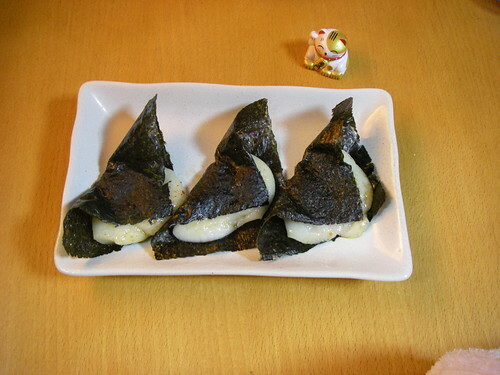 We did ours as isobeyaki (grilled and wrapped in nori seaweed) with melted cheese and flavoured with shichimijouyuu (soy sauce with seven spice mix). The last custom involved with the new year is Setsubun, which coincides with the Chinese New Year's festival (in the olden days Japan followed the same lunar calendar as China, and Setsubun was actually part of the New Year's festivities). To celebrate, we tossed dried soybeans in and out of all windows and doors to our apartment while whispering (you're supposed to shout, but Shuma had just been put down for a nap) at demons to get out and good fortune to come in. 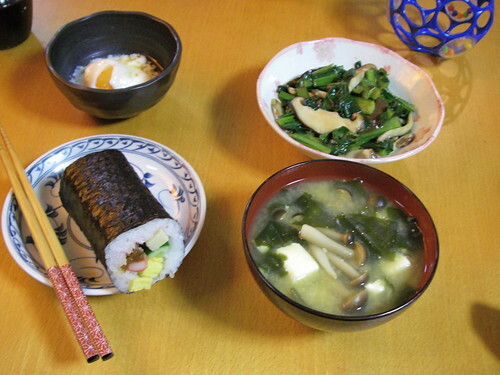 Mamemaki (throwing of the beans) is an ancient custom, but a much newer one is the eating of ehomaki, which are special futomaki (fat sushi rolls). The ehomaki must be eaten in a specific way: by hand, without being cut, without talking or pausing, and while facing the year's eho (auspicious direction). Kyoto Foodie has a nice explanation of ehomaki. Neither Hideaki or I are particularly fond of ehomaki as the filling tends to be too sweet and it's so large that eating it without pause is unpleasant. So this year I found half-sized ehomaki, which we ate in silence while facing south-southeast, pondering what kind of luck half-sized sushi rolls would bring us. Wait, I know the answer: "It doesn't really matter what size your sushi roll is, it's how you choose to interpret it." :D I had to burst out laughing when I read about your shimekazari! Well, obviously half sized rolls will get you half luck. Ha ha! Half good luck. Priceless. I've been lurking since 2007 without saying a word (sneaky, ain't I? )...but I just wanted to finally say how much I appreciate your blog. Thank you for taking the time to write and post photos (and I love the pics of Shuma--he's a darling! ).